Diners don’t typically get to see how restaurant kitchens are run. But if they did, most would be shocked by the amount of perfectly good food is thrown away every single day. 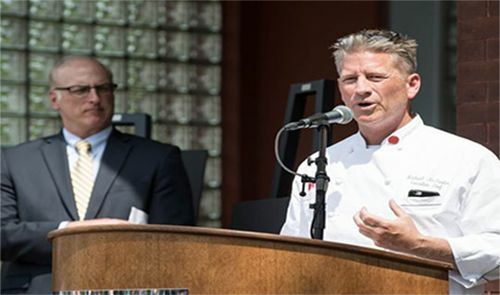 After spending his career as a chef and working as the Vice President of Food and Beverage at FireKeepers Casino Hotel in Battle Creek, Michigan, Michael McFarlen saw how much food would get thrown away from the casino’s restaurant every day. Unfortunately, throwing away perfectly good food is extremely common within the restaurant industry. Yet it was always something that bothered McFarlen about his work. At one point, McFarlen decided to get involved with the South Central Food Bank of Michigan Inc. to help give back to those in need. McFarlen later became the president on the board of the South Central Food Bank of Michigan Inc. and got to see just how big of a need there was for food among people in the community. After that, he knew he had to do more to help his community and reduce his food waste. After some thinking, McFarlen came up with a plan to open a restaurant in the community that would also help support a food pantry on the property. After presenting the idea to FireKeepers leadership, they were immediately on board with the plan and agreed to help McFarlen make his dream a reality. In April of 2016, the FireKeepers Casino Hotel and its owners, the Nottawaseppi Huron Band of the Potawatomi, bought Fire Station No. 4, a historic firehouse near downtown Battle Creek that had been closed for years and was set to be demolished. However, the group bought it before that happened and started renovating the historic building to give it new life. The plan was to renovate the building and turn the fire station into a restaurant, bakery, and food pantry in the back of the building to help people struggling to secure their next meal. Renovations on the property lasted about a year. Then on April 19, 2017, the restaurant, which they named The Fire Hub, opened to the public for the first time. At the same time, the food pantry, which they named the Kendall Street Food Pantry, opened its door in the back of the building. “Anytime you open a new restaurant, you just have to figure a way through that first year,” George said. However, the first year of operation exceeded their expectations. Not only did the restaurant attract customers because of its popularity and sustainability, but the food pantry helped more people in the first year than they ever imagined would need its services. According to McFarlen, the team expected that somewhere between 65 and 70 households would get help from the pantry every distribution day, which is every Monday evening. After word spread about the pantry, however, about 100 people started coming every Monday. In total, about 375 to 400 households get help from the food pantry every single month. Those who go to the food pantry are only allowed one visit per month, however, about 45 percent of the people who have gone to the pantry only have used their services once. When you think of people using food pantry services, you think of homeless or unemployed people. In reality, however, many of the people who have needed the food pantry’s help are people that are employed but still struggle to afford to pay for groceries. According to Heather Mauney, director of Agency Relations for the Food Bank, some of the people who use their services are on a fixed income. As a result, they will probably need long term support and might always need help from food pantries to get by. “We’re able to cater to people who are working, but still need a little help during the month,” Mauney added. “The need has not decreased. If anything it has increased and shifted.” To better fit the need of the majority of people using their services, the food pantry was designed to look like a small market. “We wanted to take away the stigma and make it more like they’re going into a bodega or little store,” McFarlen says. To make people more comfortable, the pantry shelves are stocked and arranged neatly. There are also shopping carts so people can come in and ‘shop’ for their goods. On top of providing the typical pantry goods, McFarlen wanted to figure out a way to lower food waste at the Casino and Hotel. “We purchased the equipment that is necessary to receive the proper licenses to flash-freeze food from the buffet and we make family trays out of them,” George explained. “In addition to canned goods and fresh fruits and vegetables, we supplement them with family portions from the buffet,” George added. Once packaged, the food is taken to the food bank, which distributes the meals to partner agencies. Last year, over 14,000 pounds of frozen food from FireKeepers was distributed to food pantries in the area.